A Little Bit etc. 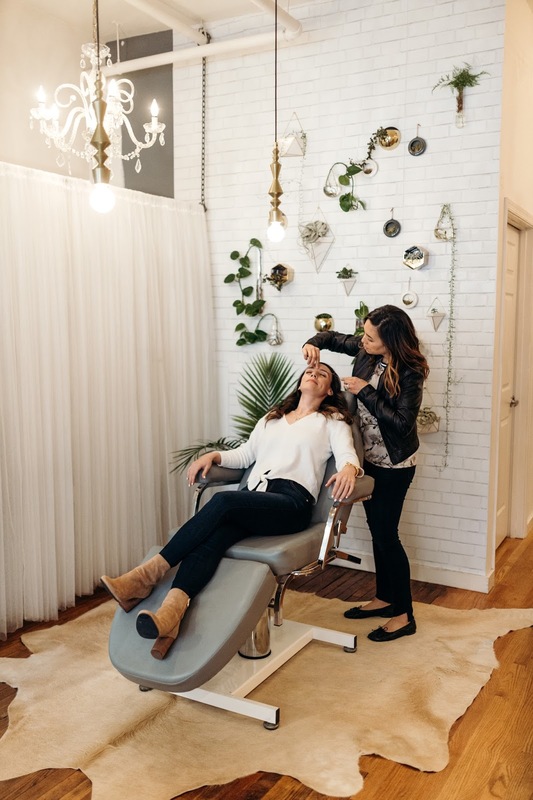 : Q&A with My Brow Threading Specialist - Answering All Your Brow Questions! 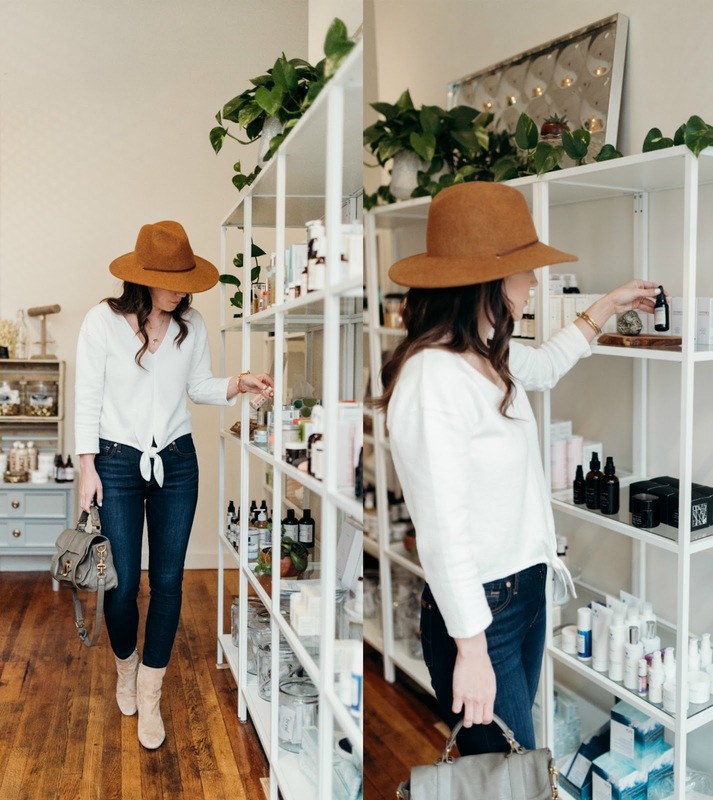 Q&A with My Brow Threading Specialist - Answering All Your Brow Questions! 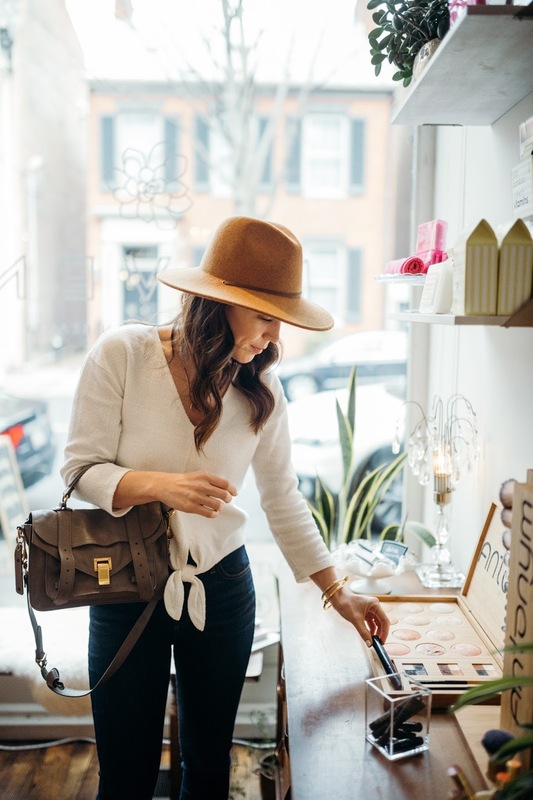 Shirt - Madewell (similar here) | Jeans - 7FAM | Boots - Sam Edelman (similar here and here) | Hat - Brixton | Bag - Proenza Schouler | Necklace - Wanderlust | Bracelets - Vita Fede and Miansai | Lips - MAC "Peachblossom"
Today's post is all about brows! I personally am very fastidious about my brows and their maintenance and get them threaded every 2.5 weeks like clockwork. A good brow shape can truly enhance a person's appearance, and I find it makes the biggest difference in how my face looks. I first began getting my brows shaped in college but was getting them waxed regularly which resulted in burned skin and too many hairs being removed. When I moved to NYC, one of the first things I looked for was a place to get my brows groomed. I read about a technique called threading and there was a salon right down the street from my apartment. From that first appointment, I was hooked. I loved the way threading made my brows look, how much less irritation I had after and how clean and precise of a shape I was able to get. Since then I have been getting my brows threaded, and even looked for a place to go while on vacation because I am crazy about always having them look their best. 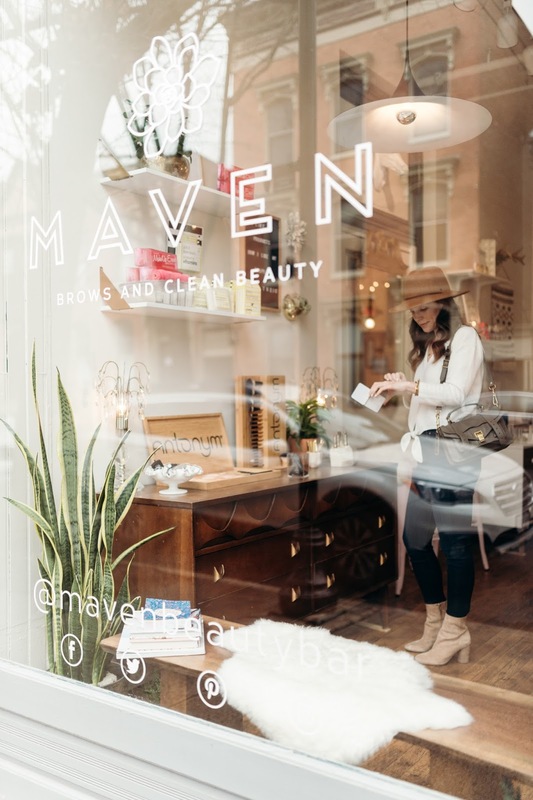 When I moved to our current home, I was lucky because my close girlfriend Rebecca Carrera owns her own beauty store and brow studio called Maven Beauty Bar that specializes in threading. She like myself is meticulous about brows and understands my need for maintaining them and having the best shape. 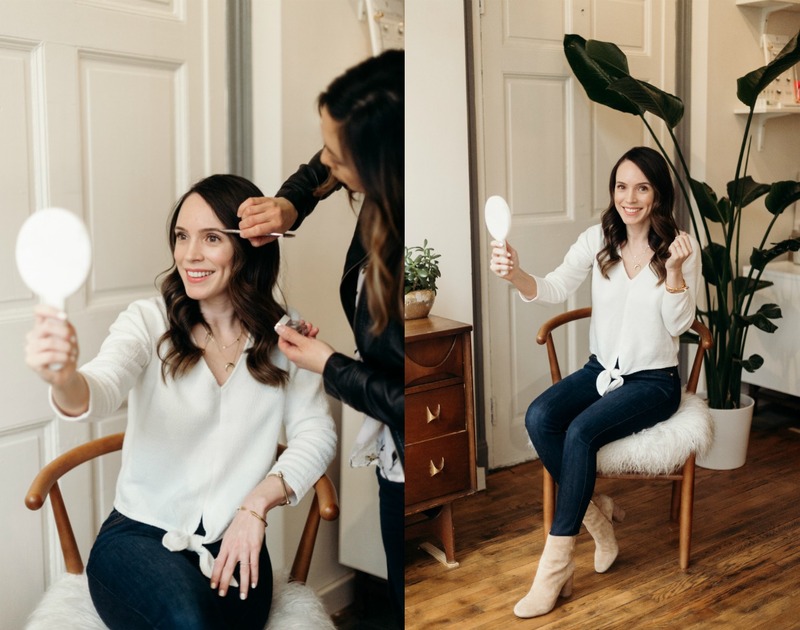 I sat down with her recently and asked her to answer some questions I have received from readers over the years about brows, and specifically brow threading. And I also included pictures of how it looks when I get threaded (pic #1 and #2) and how best to guide your own brow shape. Typically the brows should be in line with the side of the nose, the arch should be in a diagonal with the center of the eye and the end of the brow should be in line with a diagonal line coming from the side of the nose. Refer to picture #3 above to see more detail. 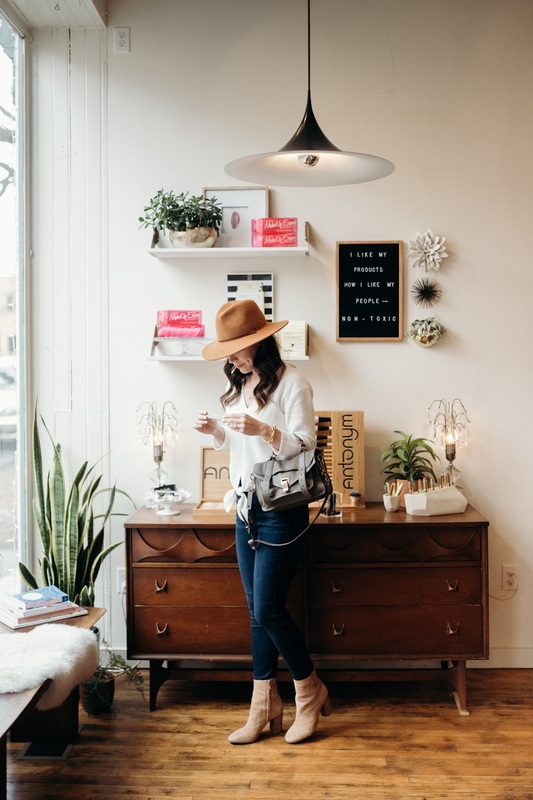 From a discomfort standpoint, I don't feel that it is any more painful than waxing was for me and I never have irritated skin afterwards which was always an issue for me with hot wax. In my personal experience, threading has changed my brows for the better and I will never go back to anything else. And now for my Q&A with Rebecca! 1. How do you find the perfect brow shape? You can measure according to what is symmetrical, but almost everyone has one good brow and one brow that does it's own thing. It's up to the artist to assess your brows for your unique face shape and make them as even as possible. 2. 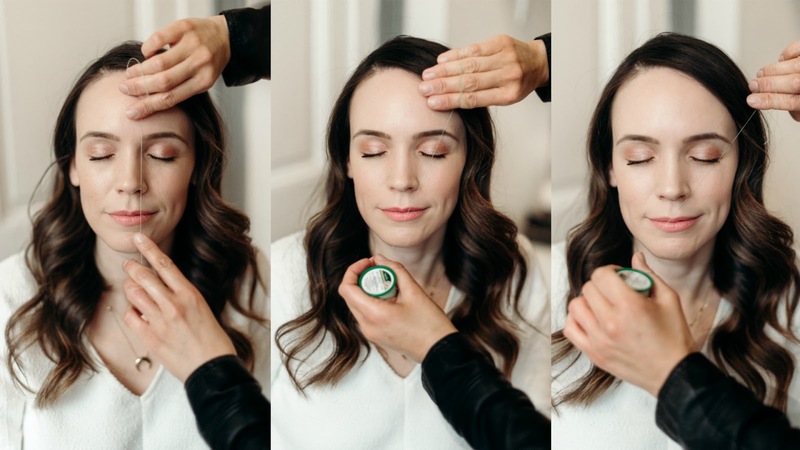 What are the benefits of threading? Most importantly it's completely natural and there are no chemicals/no heat that can burn the skin. It's also incredibly precise! You can get a clean line and grab all the little peach fuzz hairs that waxing can leave behind, which is amazing especially for blondes! 3. If I have sensitive skin or am using Retin-A/strong exfoliants/just had a peel, can I get my brows threaded? Absolutely! It's the only form of hair removal that can be done while using Retin-A. 4. How do you find the right color to use to fill in the brow? We look at the root color of the hair on your head. It's the closest to your natural brow color. 5. What are some of your favorite brow products? Pomades like Ecobrow and Plume are my favorites. Used with a small angled brush you can create a thick defined look or soft feathery look, depending on how you apply it. 6. What is the difference between threading and waxing? Pro/cons? With waxing you can burn the skin chemically or with heat and you can remove hairs that you don't want to. You can't see what the wax is grabbing underneath the muslin strip. 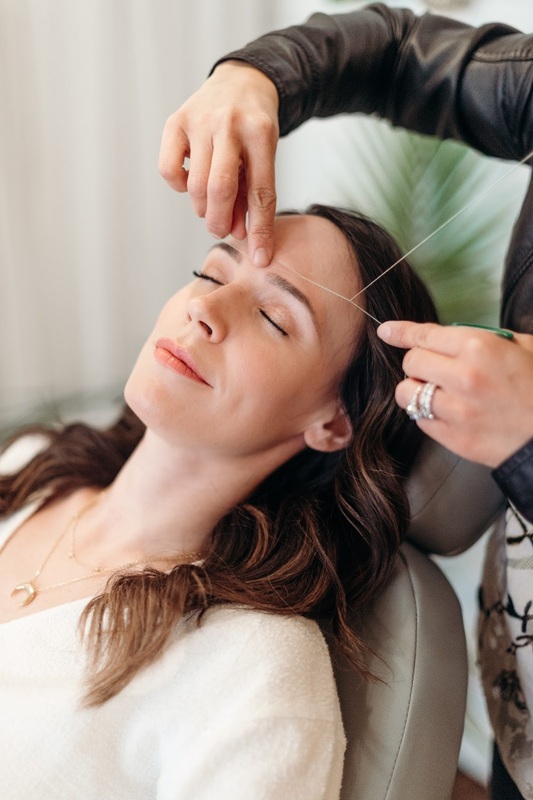 Threading is completely natural and anything we can do to limit chemicals in our life is a win. Also, the precision you get with threading is unmatched. 7. Any tips on how to get eyebrows to grow out if you have over plucked them? Take a Biotin supplement daily, my favorite is Be Biotin. And use an all natural brow and lash growth serum like Plume every night. I have had personal success with this and use Plume serum religiously. 8. How to manage long, coarse brows? Trimming long coarse brows is key. Allow a brow artist to trim them since it's very difficult to achieve an even look when you're looking at them in the mirror backwards and you're either right or left handed. One wrong snip and you'll be waiting weeks for them to grow back. 9. What brow shape and grooming tips should you follow as you get older? Thicker brows are more youthful looking, so be careful during your younger years not to over pluck. Also, filling them in with a brow color can really lift the eye area up and take 10 years off your face. 10. Do you recommend brow trimming at home to help keep them tidy? And if so, what are your tips to ensure it is done correctly? No, not at all. Please go see a professional. Use brow gel in between visits and leave trimming to the brow specialists. If you have any additional questions that we didn't answer, feel free to leave a comment below and I will reach out to Rebecca with them!